Viola “Belle” (Marsh) Brown had been a widow for four years when she commissioned a collection of rental bungalows to be built on her property in 1923. Taking advantage of the demand for housing created by the local oil boom, she built Brown’s Court Apartments to secure a steady source of income. The Michigan native was born in 1870 to Moses and Nancy (Sargent) Marsh, prominent Midland settlers who owned 120 acres of land. She was one of five children. Through Belle’s mother (the Sargent family) she was a direct descendant of the Mayflower pilgrims who arrived in America in 1620. 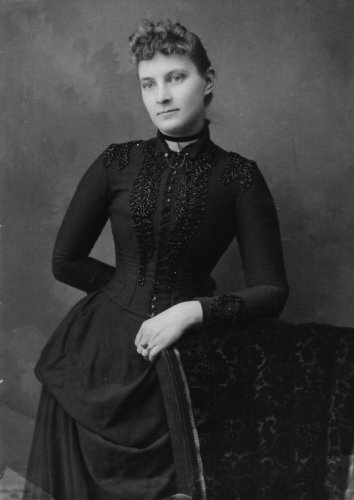 Belle married Luke Brown on October 25, 1893 and moved to Ithaca, Michigan, where Luke was employed in the hotel business. A few years after they married, the Browns purchased a farm but Luke’s poor health made it a brief venture. They moved to Long Beach, California in 1906 and purchased the single-family home property that would eventually be torn down and become Brown’s Court Apartments. Luke worked in real estate, with the Browns acquiring several other properties over the years. Luke was working for a copper mine syndicate in Hayden, Arizona in the winter of 1919, when he had a brain hemorrhage. He returned to Long Beach and was critically ill for about a week before he passed away. He died on May 31, 1919 at the age of 61, and was buried at Sunnyside Cemetery. A young widow at the age of 48, Belle scrambled to make ends meet. She hung on to the Colorado Street property, but sold the remaining properties and took a job as a servant. In 1923, Belle hired architect Joseph H. Roberts and builder Raymond P. Mussetter to design and build a Spanish Bungalow Court. Viola borrowed $17,050 to build the Court Apartments and was able to pay the quarterly interest until 1932. By that point she had entered into a trust deed with Maude Homer, a wealthy singer/musician who owned a lot of real estate and was known to be a savvy investor. Belle deeded the property to Maude Homer and moved to Hemet with her sister Almira “Della” Cornell, who came to live with Belle sometime after Luke passed away. Belle was still living in Hemet when she died of hemiplegia (paralysis, most likely related to a stroke) on February 28, 1936 at the age of 65. She was buried next to her husband at Sunnyside Cemetery.